The below artworks are the most important by Berenice Abbott - that both overview the major creative periods, and highlight the greatest achievements by the artist. Artwork description & Analysis: In this portrait, Eugène Atget, with a bemused expression on his face, stares out at the camera. The elderly French photographer presents himself formally dressed in a suit and tie under a thick dark overcoat and in his right hand, which rests on his thigh, he holds a pair of glasses. Yet, the personal interaction between Abbott and Atget is the actual subject of this portrait, partially revealed in Atget's facial expression. The photo-historian Gaëlle Morel contends that, "through her compositions, Abbott succeeded in formulating a genuine aesthetic, with its rejection of commercial conventions. The absence of décor and the fact that the background is more often than not reduced to a neutral section of wall tend to isolate the subject, emphasizing his or her bearing, physical position, and facial expression." This portrait is significant since Abbott was the only artist to have taken a formal portrait of Atget. Abbott considered Atget, "...the most important forerunner of the whole modern photographic art." She dedicated part of her career to promoting and including Atget's work into the most important modern photography exhibitions in late twenties and thirties. Artwork description & Analysis: Berenice Abbott portrays Jean Cocteau, French surrealist artist, poet, writer, and filmmaker, sitting in bed with a somewhat vacant expression, which mirrors the expression on the paper mâché doll head he cradles in his left arm. Cocteau and the paper mâché doll are covered by a white sheet and the white, neutral color of the bed linens plays off the striped wallpaper on the background wall. As a whole this image echoes the contradictory pairings of objects and humans often found in the paintings of Giorgio de Chirico and René Magritte. This photograph is one in a series of portraits Abbott took of Jean Cocteau, sitting or lying in bed. The series, rather than a single photograph, Abbott contended, could best capture the complexity of a person's character. On another level, it points to Abbott's interest in the interplay between the visible and invisible aspects of character. Cocteau addresses this very issue from a surrealist viewpoint by drawing out the complicated relationship between his body as object and himself as subject. While Cocteau chose to frame himself in this way, Abbott reacted to both his appearance and unconscious self in the taking of the photograph. 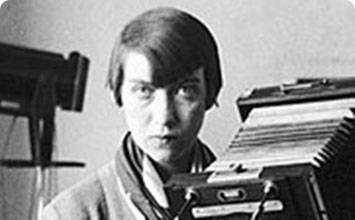 Portraiture served as Berenice Abbott's primary livelihood while living in Paris in the mid-1920s. It marks the formative phase of Abbott's realist photography, which she practiced throughout her career. Abbott's approach to the practice of portraiture owes much to Man Ray in terms of flattering soft-focus, artificial lighting to create a sense of mystery and depth, among other details. Yet unlike Man Ray, Abbott used the portrait as a vehicle to reveal the sitter's character, as gleaned through their communicative expression, physical presence, and intellectual depth. Abbott's approach to portraits and her desire to highlight the unique qualities of her subjects can be seen as laying the foundation for artists working today such as Gillian Wearing who uses portraits to make statements about the relationship between public and private identities. Artwork description & Analysis: Abbott's photograph depicts the city of New York at night, which is identified in the title. The white of the lights in the buildings and headlights of cars on the streets below contrast starkly with the solid structures of the numerous buildings that dominate the city. Taken between 4:30 and 5:00 pm, when the office lights remained on and the city was slightly darkened, Abbott scouted the exact view from an upper floor of the Empire State building. She calculated the exposure for 15 minutes, using only the light that emanated from the city below. On December 20, 1934, Abbott captured New York at night to represent the emergence of this modern city, characterized here by its illumination, as seen from the dizzying heights of a skyscraper. Upon returning to America from Paris in 1929, Abbott was immediately struck with New York City. She once stated, "New York is the face of the modern city, bred of industrial centralization. Our age is ruthless, hard, competitive, tense, greedy. It shows as much in the faces of buildings as in the faces of people. That character I have sought to recreate in my photographs." This image, perhaps her most well-known, remains a visually exciting example of the many hundreds of photographs Abbott produced to document New York City, which were published in her book Changing New York (1939). Artwork description & Analysis: The image focuses on the facade of the Exchange Court Building, whose width appears to define the space in-between the Adams Building and the North American Building. Abbott thus captures the narrow expanse between skyscrapers at Broadway and Exchange Place. Barely 25 feet wide, Exchange Place is overhung by skyscrapers that are 300 and 400 feet high, on either side. In this image, Abbott presented the buildings as powerful modern structures towering over the pedestrian viewer from below. In the process of documenting the city, Abbott set out to present it in aesthetically interesting ways that represented the living essence of the city and captured "moments" found in the city. Yet, this image appears in Abbott's scrapbook that she used to sketch out her ideas of how to photograph New York's urban landscape. In these early photographs, Abbott emphasized vertiginous angles and odd perspectives, as well as abstractions of pattern and light. The casual quickness of these photographs, taken with a handheld camera, convey a more frenzied and spontaneous view of the city in comparison to how the city is represented in her photo book Changing New York. The image of New York appears in the photo book to be largely architectural, which contributed to a more controlled and organized view of city life. 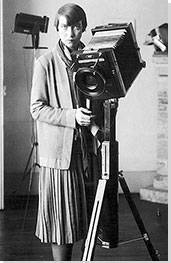 Abbott received funding in 1935 for her ambitious project to document New York City from the FAP. At the project's conclusion in 1939, FAP distributed complete sets of Abbott's final 302 images to high schools, libraries, and other public institutions in the New York City area. The archive of Changing New York is now housed in the New York Public Library and contains approximately three-quarters of the 302 images contained in Abbott's definitive version of the project. Artwork description & Analysis: This image of a shop sign captures Abbott's fascination with New York's vernacular culture. The hand gun as sign fills the picture frame and is viewed from below and against the facade of the facing building. A wooden plank hangs below the large handgun to advertise the shop's name "Frank Lava Gunsmith." At the time, this particular shop catered to the city's police department, which so happened to be right across the street. This photograph recalls the pictures by Walker Evans, who worked for the Farm Security Administration (FSA) in the 1930s. Abbott and Evans share a penchant for everyday shop signs, cheap cafés, and advertisements. Yet, Abbott moves beyond Evans in her use of a low angle to monumentalize the ephemeral sign. As part of her Changing New York project, this photograph demonstrates Abbott's interest in capturing the daily experience of the city through objects and people, and not just through the city's architecture and landmarks. According to the photo-historian Sarah M. Miller, "...Abbott has decisively shifted the photographic subject from recognized landmarks to camera-generated relationships [...] Shot from a vantage point that makes a gun-sign traverse the picture plane to aim at the optically distorted police station, Gunsmith reveals that the cityscape does not represent benign national authority derived from communal memory or bureaucratic planning - but neither is it fully random or irrational." The city's multiple features and cultures were revealed in Abbott's photographs that demonstrate the medium's communicative power, as a vehicle for political commentary. Artwork description & Analysis: This photograph successfully captures how light beams are both particles and waves, thus visualizing the concept of wave-particle duality. As the photo-historian Terri Weissman explains, "...a large triangle is positioned at center left, with six beams of light projecting from a small rhombus-shaped box, cut off at the bottom of the frame. These beams intersect the bottom side of the triangle, with three beams exiting the triangle through the left side, while the remaining three are reflected and exit through the triangle's right side. This arrangement of light beams enables the photograph to represent the concept of wave-particle duality - a famously counterintuitive property." This concept in quantum mechanics expresses the possibility that particles and waves do overlap and that light can be observed as a particle as well as a wave. At the same time, Abbott's ability to capture light in its most basic forms demonstrates why photography is the medium of the modern age. Science photography became an important project for Abbott from the 1940s to 1961, because "science is the great reality of our time. The union of photography with science will evolve the new art." Her desire to use photography to help visualize scientific principles and theories led to her collaboration with the Physical Science Study Committee (PSSC) at MIT to create photographs to be used in high school science textbooks. For Abbott, her science photographs are her most realist, because they make the difficult comprehensible and successfully mediate between the expert culture of twentieth-century science and the lay public. Artwork description & Analysis: In this photograph, a lone male figure walks down the middle of a two-lane highway in Maine, as though he owns the road. To his left is a fence separating the road from the natural landscape near which are posted two signs; one indicating the road is US Route 1 (from which the image gets its title) and another one warning drivers of the illegality of passing a stopped school bus. And a tall evergreen tree stands to the right of the fence in the background, yet in line with the other road signs. Its dark silhouette mirrors the figure of the lone figure in the middle distance and contrasts with the gray sky. Abbott situated the male figure in the middle-distance and used a clear gray light to tie the lone male figure to his own natural and man-made surroundings. The lighting and middle-distance shot reveal the photograph as a picture distinct from reality itself. This effect is key to Abbott's realism, because, as the photo-historian Terri Weissman explains, "everything that results from the gray light, the magnification of detail, the clear forms, the production of distance between us - the spectators - and the working man, reminds us of our gaze, of the fact that we are looking at a picture of an event that has passed, yet continues to exist through our engagement with its image." Abbott first developed this strategy in 1935 while working on her unpublished photo book that was to be a portrait of the nation. This strategy allows Abbott to make the picture look like a document and yet acknowledge its own process of representation, which involves the entangled relationship between the viewer and the viewed, the photographer and the viewer, and the photographer and the subject..
Taken in 1954, this image is part of a series of photographs Abbott took while driving down Route 1, along America's Eastern coastline from Maine to Florida and back again. During this trip down Route 1, Abbott pursued the ambitious project of documenting the whole American scene. Her photographs captured scenes of everyday American life, charting the differences in geography and backgrounds that characterized the United States as a changing country. First published on 24 Jul 2018. Updated and modified regularly.